If you’re looking to add color to the garden and create an ornamental effect, a good place to start is by adding a few Bright Lights to the scenery. Bright Lights as in the colorful variety of Swiss Chard that has become popular and is even finding its way into landscape beds and flower gardens. The distinct and most entertaining feature of this leafy green vegetable is the wide range of unusual and vibrant colors that the plant displays in the garden. Some of the hues are unlike any that you’ll find elsewhere in the world of vegetable plants. Sometimes arrayed in flashy and bright colors, this chard can also exhibit the subtle shades of various pastel colors, either way its a real attention catcher. The colors extend from brilliant reds, to orange, yellows, pink, cream, gold, purple, and even some plants that are arrayed in white with red stripes and streaks running the full length of the plant’s stalks. I especially like the banana yellow and the unique orange-colored plants that really stand out in the midst of other vegetation. The glossy dark green, savoyed leaves offer a nice contrast to compliment the brightly colored stems and leaf veins. In addition, Bright Lights Swiss Chard can take on a glossy sheen that makes it appear as if the plant has been coated with a few layers of rich wax or sprayed with lacquer. It’s easy to Grow Swiss Chard and the plant is adaptable enough to grow with minimal care from spring through fall, and in mild climates will even survive the winter to produce additional harvests of tasty leaves the following spring. Bright Lights isn’t the biggest or tallest growing variety of Swiss Chard, with the plants reaching a mature height of about eighteen inches, but the plants are still very productive. 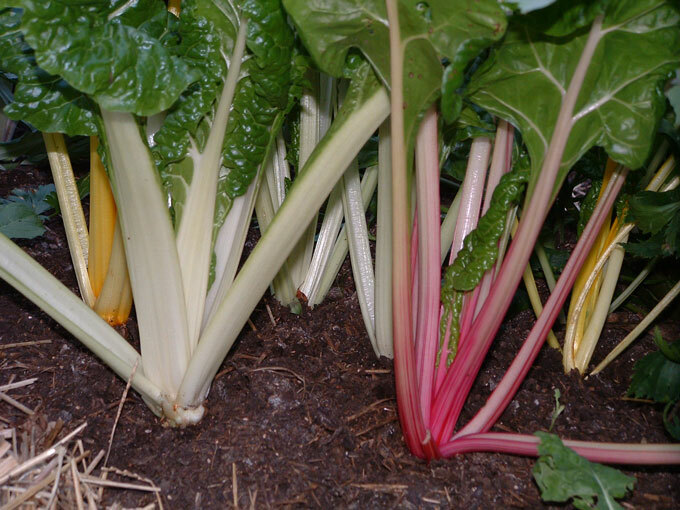 If you’re interested in the monster sized chards try Fordhook Giant or the red stemmed variety called Rhubarb. The seed for Bright Lights is usually sold in packets that combine a mixture of all of the colors that the variety offers. 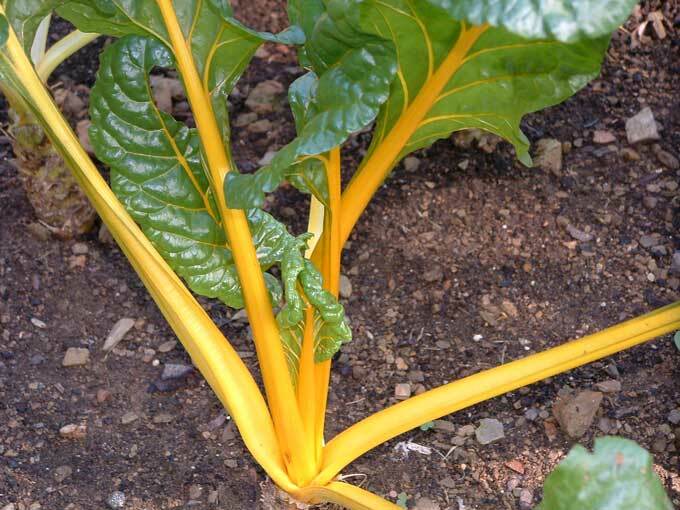 You can often locate transplants of this Swiss Chard variety at greenhouses and garden centers in the springtime. 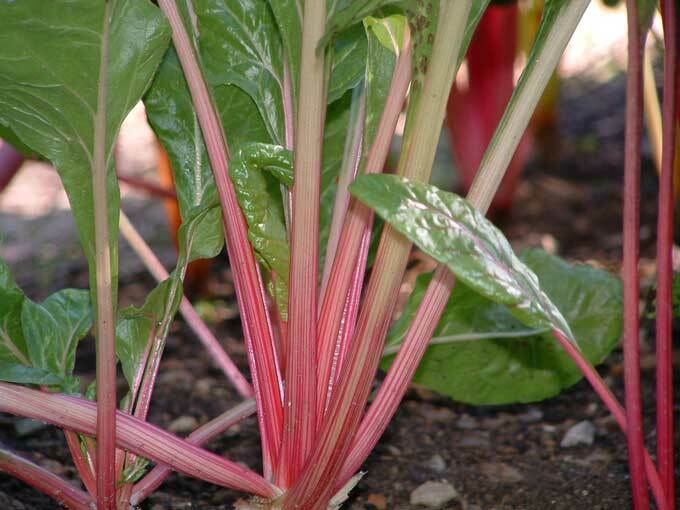 It’s impossible to judge what color a plant will be by looking at the chard seeds, so you may want to plant more than you need just to ensure that you wind up with a full range of colors displayed in the garden. The seeds can be started indoors or planted directly in the ground. It may take a few weeks of growth before you can determine the exact color of the seedlings that you are raising. The young seedlings transplant easily if provided with reasonable care, making it a cinch to position them or use them to fill in bare spaces. To create the most attractive ornamental effect in the garden, plant Bright Lights Swiss Chard in groups or clusters intermixing the various colors. This edible plant is beautiful and social enough to make itself right at home in the flower bed, serve as a border, or even stand side-by-side with other landscape and ornamental plantings. 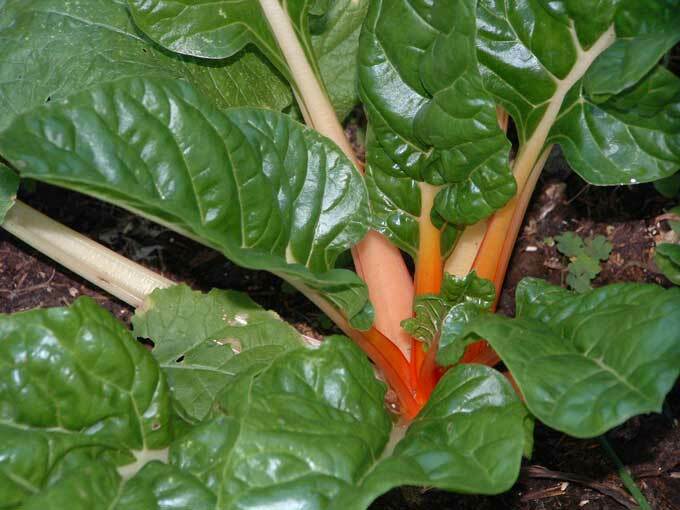 Bright Lights Chard is not only showy in the garden, but can also create interest and add the same range of colors to your meals, especially when used without cooking them. Cooking will tend to wash out some of the color so lightly steaming will preserve more of the color than boiling this leafy green vegetable. The large leaves can also create an attractive garnish or wrap, while the colorful stalks can be stuffed or used to liven up your favorite vegetable trays. I grew something very similar this year, but I forgot I’d gotten anything special and when the colors started showing up–wow! I had to remind myself I had my youngest at the nursery that day. We got rainbow radishes, rainbow green beans, rainbow chard… She likes her colors! The plants were very pretty. I had them in a spot right outside my kitchen door but had thought to add them to the flower border as well next time they were so pretty. Taste good too! Genie, my back yard reminds me of a jungle at times and I had my share of “predators” this year, especially those ferocious chard-eating groundhogs! Ellen, those rainbow varieties and colorful vegetables like Bright Lights Swiss Chard do dress up the garden quite a bit, I also think the unusual colors are a sure sign of the presence of specific health promoting nutrients that make great additions to our diets as mentioned in the article about colorful carrots. This reminds me of great article I read recently about Vegetable Gardening ” A lush and healthy vegetable garden begins not with seeds in addition to a spade but with paper as well as a pencil. Drawing plans will possibly not sound as important as getting outdoors and planting things. ” a very fine point thought I might share it.